David Kramer, an associate of Senator John McCain, invoked his Fifth Amendment right to not testify to Congress in connection to his role in distribution of the fake Russia dossier to the FBI. Kramer was briefed by the Russian dossier author Christopher Steele in London in 2016. The Russian dossier was paid for by the Democratic National Committee and Hillary Clinton’s presidential campaign. The junk dossier was used as evidence in a FISA court hearing as evidence to spy on Trump volunteer Carter Page — in October 2016. Kramer then returned back to the US and delivered the phony dossier to John McCain. McCain handed the document over to the FBI. 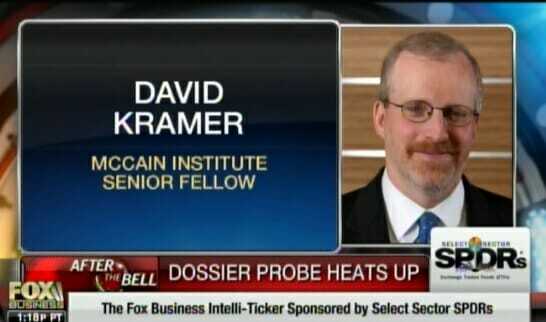 David Kramer is a senior fellow at the McCain Institute for International Leadership at Arizona State University. James Comey knew about the dossier — used the unverified to spy on Trump earlier in 2016. They knew was a crap document but wanted to spy on Trump, his campaign and family. On Wednesday it was confirmed that Kramer also gave the junk dossier over to Buzzfeed for publication. BuzzFeed published the dossier, which was authored by former British spy Christopher Steele, on Jan. 10, 2017.